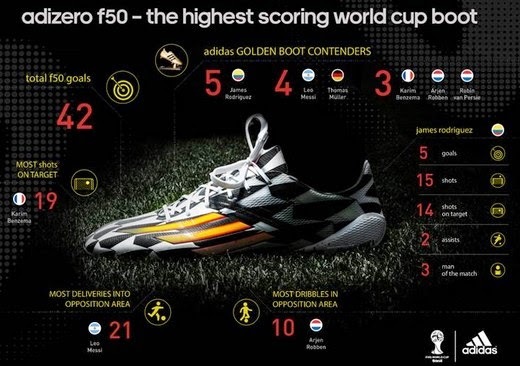 July 2014 – Herzogenaurach/ Rio de Janeiro – With the quarter finals of the 2014 FIFA World Cup Brazil™ now decided, the stats reveal that the adidas adizero f50 is currently the top scoring football boot at the tournament with 42 goals scored by players wearing it. adizero f50 is the boot of choice for an incredible six of the tournament’s top nine goalscorers. This includes World Cup sensation and adidas Golden Boot leader James Rodriguez of Colombia with five goals, with adidas stars Leo Messi (four), Thomas Müller (four), Robin van Persie, Arjen Robben and Karim Benzema (all three) also competing to be top goalscorer. James Rodriguez has taken the tournament by storm, with three Man of the Match displays and two assists to accompany his five goals. This has come from 15 shots on goal, with an impressive 14 on target. But it is not just in the goals department that the adizero f50 players are setting the pace. Arjen Robben has been responsible for the most dribbles into the area during the tournament (10), Leo Messi has delivered the most balls into the area (21), while Karim Benzema has had the most shots on target (19). Join the adidas football conversation at www.facebook.com/adidasfootball or on Twitter: @adidasfootball.